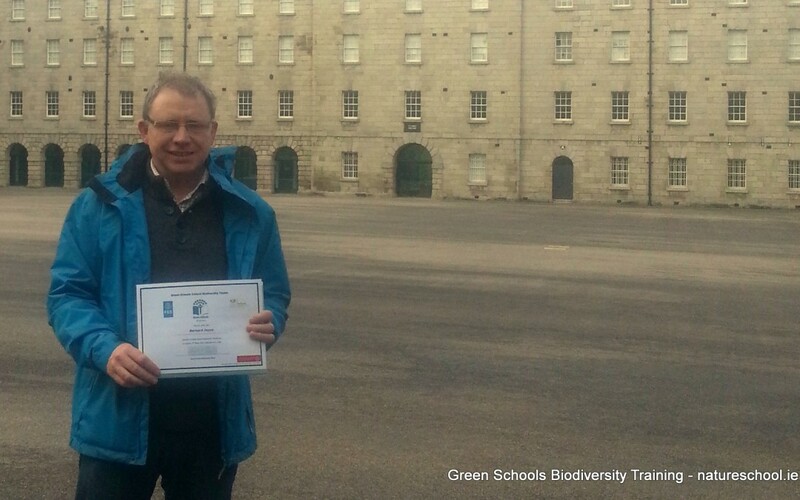 Nature School recently participated in training with Green Schools Ireland to deliver the Green Schools – Biodiversity programme in Schools in Ireland as part of the Heritage in Schools programme. Biodiversity is the fifth theme of the programme. It was launched as an official theme of Green-Schools in September 2010. Biodiversity is the huge variety and variation of life that surrounds us. Biodiversity is essential in keeping the environment healthy and fit for human life. Not only do we rely on biodiversity but our activities also have an effect on it. So whether your school is based in a city or in the country the Biodiversity theme hopes to connect you, your school and your wider community with the natural environment and cultivate a sense of wonder, appreciation and value for all the biodiversity around us. The overall aim of the Biodiversity theme is for schools to increase awareness of the importance of biodiversity and for students and staff to come up with ways in which we can help biodiversity. This can be achieved through improving or preserving your local biodiversity whether it is in your school garden, at home, a green space in the city, your local beach, a river way etc. Schools will have the opportunity to play a vital role in promoting and preserving biodiversity both locally and globally.